For those of us who grew up in the prehistoric dark ages, the internet is still a fairly new thing. Like Ernest Hemingway describing bankruptcy, we became web-literate gradually then suddenly. As if overnight the whole world and their granddaddy started using social media. It’s a fantastic method to easily share our lives with friends and far away loved ones. We can track our kids as they grow up, and document every moment that previously had to be condensed onto a VHS cassette tape. But we learned how to use the Internet. Our kids, quite literally, are born into it. It’s a staggering thought that your baby’s future Facebook page might contain their entire life story on an infinite scroll, from ultrasound to wedding snaps! But as social media websites dominate how we interact with the world, this has come with consequences. Especially for young ones, who are still fortifying their social skills. We could learn and develop ours in relative obscurity, but for the new generation they’re learning social skills online. And this can have a disastrous outcome. As young brains haven’t developed enough to fully understand action-consequence, they’re more likely to engage in high-risk behaviors on the internet. And a flash-in-the-pan reckless decision could follow them for a lifetime. It’s no secret that employers and college admission officers “Google” potential applicants. There’s a flood of online horror stories about a sour tweet or questionable selfie that had some prospective college students denied on the spot. Worst of all, even a mistake made at a very young age has the potential to shackle your child with a less-than-desirable online reputation. Such was the case with two minors in Texas, who uploaded a racist rant to YouTube. The consequences were quick and severe. They were both expelled from school, their identities released over forums, death threats sent and names tarnished for life. Whether or not they were joking, as they insisted they were, both of their reputations were destroyed from fifteen minutes spent online. And the ramifications may live with them for the rest of their lives. With the advancements in online technology, cyberbullying has also become a new and dangerous threat to the younger generations. In fact, it is listed as one of the top risks posed to kids. The number of teens that have committed suicide due to cyberbullying in recent years is absolutely heartbreaking. We might not be able to wrap our kids up in cotton wool when it comes to online interactions, but by installing them with a good understanding of what online reputation management means, hopefully we are providing them with the tools and knowledge that will keep them safe from the darker reaches of the internet. Kids are becoming more internet savvy every day. But what are some of the risks that connected kids face? The Internet is awash with TMI. Sometimes we forget that just because we can’t see everyone we’re reaching, they’re not there. Nothing could be further from the truth. 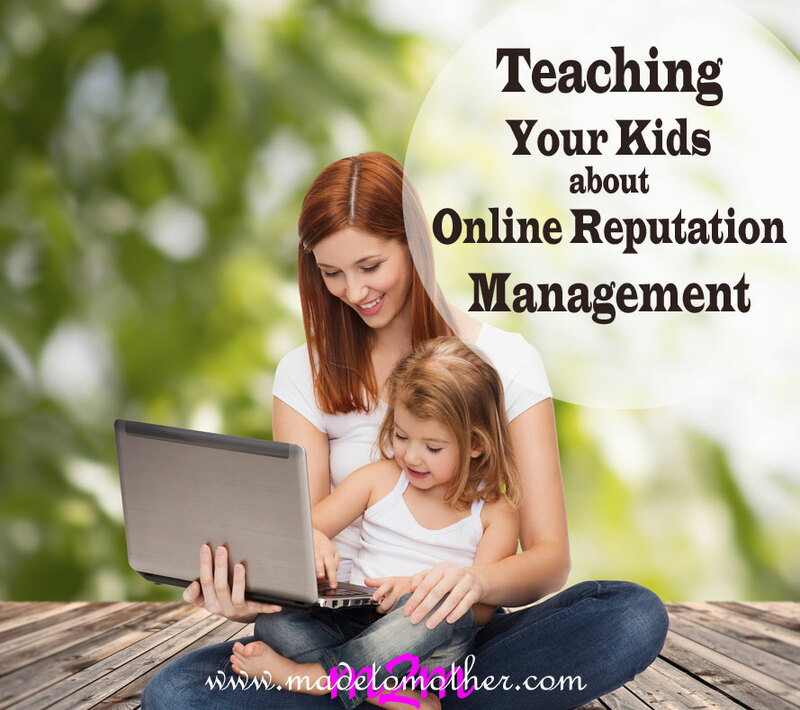 Explaining this concept to your kids is crucial to helping them manage their online reputation. Try to help them visualize how many people could view information posted online. Even if you’re alone in your room, you may be transmitting data to a football stadium full of people. Unless you’d be comfortable with everyone seeing what you post, don’t post it. Photos are usually at the source of big online problems. In the tragic cases of many teen suicides, photos were a primary factor. Graphic images were shared without their consent, and they were ruthlessly attacked by cyberbullies. When covering the basics of online reputation management, there is no greater lesson than private doesn’t always mean private. Hackers can access almost anything, so the golden rule is – never share something you wouldn’t want the world to see. Think of your social media profiles like a home. Even if you lock the front door, someone could still jimmy the locks. But it’s safer than leaving the front door wide open. If your child uses social networking, make sure that every profile has strict privacy settings in place. Always choose the most thorough settings for each account. Teach your kids to only add people that both of you know in real life. What websites am I happy with my children using? What websites do I want to keep my kids away from? How do I feel about Facebook/Instagram/Snapchat etc? Is my child responsible enough to use these sites correctly? Even the most responsible of kids can make mistakes, but by talking about it together, you can overcome some of the obstacles before they crop up. Kik, Yik Yak, Whisper and Burn Note – These sites are anonymous social networks that are frequently used by Internet predators, cyberbullies and cyberstalkers. They are best avoided altogether. Even by grown ups. The anonymous nature of these networks means should any bad characters get in touch with you or your family, they’ll be almost impossible for the authorities to track down. There’s a thin line between spying on your kids and safeguarding their privacy. But just informing your kids that you will be monitoring their profile could be enough to prevent them from posting something potentially damaging to their reputation. I believe kids as well as adults tend to give away too much information. On Social Media less is better. Great advice for all of us as to how to handle social media. Thank you for sharing this at The Weekend Brew.